Nina May from Sky News Business Channel. 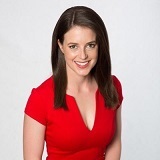 I tell ya who's gorgeous, Nina May, a relief-presenter on Sky News Australia. Stuffed if I can find her pic on the web though. Gemma Coats from Sky News and Alana Smith from Fox Sports News. Cable Satellite Female News Reporters thread includes Fox Sky & affilliates. Update now we have finished sorting i found some Nina May burried when some one ekse was looking, back in the day! There are some serious hotties on the pay tv Weather Channel (603) if anyone is able to cap. It looks like Amanda Duval has left and is now on ten?